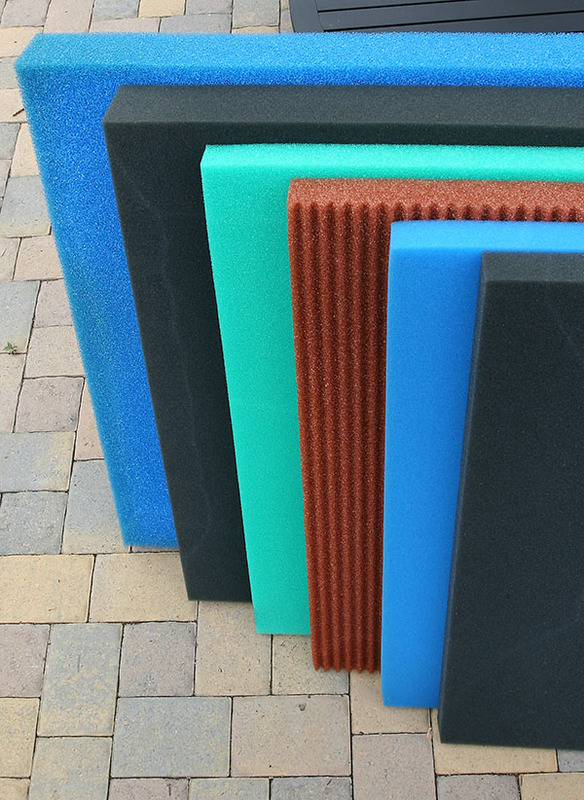 Poret ® foam is a viscoelastic polyether foam with outstanding resistance to acids, bases, hydrolysis, and other forms of chemical attack often encountered in aqueous environments such as aquariums, sumps, or ponds. The specially engineered reticulation process creates foam with ~97% defined pore size. Made by our partner EMW®Filtertechnik GmbH in Diez, Germany. EMW Filters for Fishkeeping brochure. 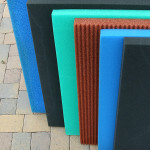 Have you ever wondered why other companies decline to reveal their foam supplier? SwissTropicals, LLC has a different philosophy: transparency. When you spend your money and you deserve to know what you are buying with it, in this case Poret ® foam brand filter foam. We maintain long-term relationships with our suppliers, and we do not purchase products in low-wage countries that lack environmental or labor standards. Long life, 5-10 years and more! High compression strength to prevent shrinking. Hydrophilic surface facilitates colonization by beneficial microorganisms. Perfect as a biofilm carrier for biofilters. 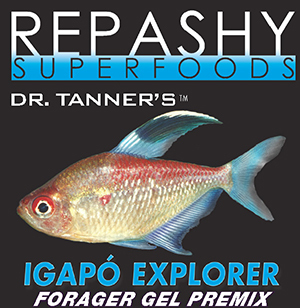 Contains no plasticizers, flame retardants, or mold inhibitors. Provides reliable service up to 80 °C/175 °F. Outstanding chemical resistance, even to ozone and oxygen. Manufactured in a CFC-free foaming process. Washable up to 65 °C/150 °F. Sterilizable with 10% bleach (max. 15 min). Available in 10-45 PPI in various colors. Material Safety Data Sheet MSDS Poret ®. Replacement media for all filter types. The internal or specific surface area of various filter media is often mentioned but rarely – if ever – experimentally verified, measured, or proven. The area that can be colonized by microorganisms depends on the cell size and structure. In this paper, the area of metallic reticulated foam was actually measured (not just guessed, made up, assumed, or copied from an obscure source) by adsorption of krypton gas to the surface (see top of page 9). Poret ® foam has the same area per volume, since metallic and ceramic foams are made by sintering reticulated plastic foams with metal or ceramic and then burning off the Poret ®. With increasing PPI the surface area increases. *this claim is at least questionable. The media looks very similar to Kaldnes®. The openings in both Kaldnes® and Easy Pro® are about 3 mm, which makes them larger than 10 PPI foam, which has 2.5 mm pores. The larger the holes or pores, the smaller the surface. Moreover, these tubes are open in one direction only, while e.g. foam, lava rock (which is essentially a foamed rock), sintered glass like Siporax®, and many filter ceramics are three-dimensional structures with correspondingly larger surfaces. The easiest way to rinse your Poret ® foam sheets is outside in the yard or driveway using a garden hose. Simply bang the sheet flat on the ground several times (Note: I recommend not wearing your best outfit doing this) to shake out the filter sludge, then rinse with the hose. Repeat until the water coming out is relatively clean. Don’t overdo it. Sufficient microorganisms will survive this procedure to quickly re-establish the biology of the filter. It does not matter if you use cold or chlorine-treated water! The often repeated notion that this process would kill all the filter organisms is nonsense, because the residual chlorine concentration in drinking water is too low to kill them all. The microorganisms are quite well-protected in the slime of the biofilm. Porosity: expressed in PPI (pores per inch) means how many bubbles are in the Poret ® foam per linear inch. Thus, 20 PPI means there are 20 bubbles per inch on average, and since an inch = 2.54 cm, a bubble in the 20 PPI foam is about 1.27 mm in diameter. The greater the PPI number, the finer the bubbles and the larger the internal surface. However, the finer the pores, the quicker the foam clogs, especially at very high flow rates. Biofilm: community of microorganisms in which cells are embedded in a self-produced matrix of extracellular polymeric substance (EPS), which is often called “slime”. The cells adhere to each other and/or the surface. Biofilms are a system/network of cells that adapts to environmental conditions. They form on living or non-living surfaces and are prevalent in natural and artificial settings. EPS is a polymeric conglomeration generally composed of extracellular biopolymers in various structural forms. Biofilms are the basis of filtration in aquariums and ponds and colonize the Poret ® foam. Plasticizers: chemicals added to plastics to make them soft; they are often volatile and toxic. When the plasticizers evaporate, the plastics become brittle (like some filter sponges). Poret ® contains no plasticizers.